Ian Talbot is Artistic Director of the New Shakespeare Company. His theatrical roles include Bottom in A Midsummer Night’s Dream, Touchstone in Twelfth Night, Hortensio in The Taming of the Shrew and the Fool in King Lear. 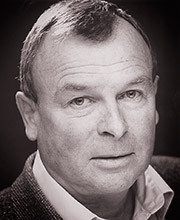 Directing credits include Joe Orton’s Good and Faithful Servant, Kiss Me, Kate and Lady Be Good, Much Ado About Nothing and The Pirates of Penzance.